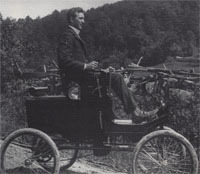 Mr. Warren was a serious auto enthusiast who in addition to purchasing the first automobile in Vermont (1899 Haynes Apperson) held Vermont registrations #1 and #2. Between 1903 and 1905 he drove his 28hp Packard over 10,000 miles. 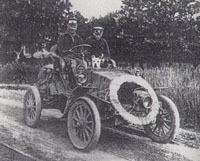 In addition, he and Mr. L. Bart Cross, of Montpelier, used the same car in a European tour in the fall of 1905. Mr. Warren’s estate on Main Street in Waterbury is now the grounds of the State Office Complex and State Mental Hospital. His house and carriage still stand on Main Street. Dr. Jackson was another devoted enthusiast. While in San Francisco he came to the defense of the Automobile in a discussion at the S.F. University Club. 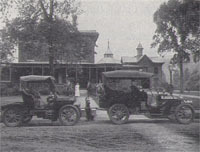 On the strength of a $50 wager that it couldn’t be done, he took up the challenge of driving an Automobile from San Francisco to New York City. He purchased a nearly new, 20 hp, two seat Winton which he named “Vermont” for the trip. He and his companion, Sewell Crocker, a mechanic from Tacoma, Washington, left San Francisco on May 23, 1903. The first set of tires was completely worn out even before the pair had gotten out of California! Roads were just about nonexistent and gasoline, or benzene, was definitely not in plentiful supply in the west. Crocker once had to hike 20 miles and back to obtain 5 gallons of the stuff at one point (he probably lost the toss of the coin). In spite of several harrowing experiences, the “Vermont” and the two men, and a bulldog, Bud, picked up in Idaho, arrived in NYC on July 26 – 4500 miles and 64 days later – thus completing the first successful transcontinental trip of an automobile. In 1954 Dr. Jackson was made an honorary member of the VAE in recognition of his epic journey. * The VAE did a re-enactment of the return of Jackson & Croker at the Shelburne Car Show in 2003. Click Here to see the pictures. Born in the Northeast Kingdom to poor hill farmer peasants, Henry Leland overcame great adversity in his early adulthood in Vermont and Massachusetts to become a precision tool maker, inventor and self taught mechanical engineer of extraordinary ability and foresight. He established the manufacturing standards which made mass production of the automobile possible. Henry Ford may have put the nation on wheels but it was Henry Leland who had developed the necessary machining methods which made it possible. Both the Cadillac (the first truly mass produced automobile) and the Lincoln Automobile were the direct developments of Henry Leland. The first Cadillac was completed under Henry’s guidance in October of 1902, and in 1903 a Cadillac won a 1,000 mile reliability contest sponsored by the Automobile Club of Great Britain and Ireland. Henry Leland came to be known as “Detroit’s Best Citizen” for he directly or indirectly helped millions of Americans learn what his mother had taught him as a child in Vermont – “There is a right way and a wrong way to everything” she had told him. “Hunt for the right way and then go ahead”. Simple Vermont philosphy helped to create the incredible automobile industry in the United States. 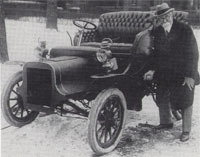 Royal Peake (Peveril’s father) is shown here in his 1900 Locomobile Steam Car which he acquired from Dr. Lindsley of Burlington in 1900. It took two days to drive from Burlington to Bristol, his home, requiring him to spend an overnight enroute. This Locomobile was the first automobile to come to Bristol and to take up residence in that town. Mr. Peake, an early automobilist owned several fine cars in the course of his years, which were many. It is also believed that this Locomobile was the second autombile in Vermont.